I’ve gone through various iterations of chisels over the years and finally found the perfect chisel for me. The new IBC bench chisels with the walnut handles fit my hands perfectly and the quality of the steel is unmatched in my opinion. Right out of the box they performed perfectly cutting in the butterflies on a new live edge walnut coffee tale. The ability to remove the handle & ferrule for sharpening is unique and makes sharpening easier and more precise. Also, the ability to customize the handles is icing on the cake for me. If anyone is looking for new chisels give these a try, I guarantee you they will be your chisel of choice for years to come. If you call them they are very helpful and will answer any questions you might have. I forgot to put the link in. Best you go to their site and view all their products. As putty said, the table pic makes no sense. Why would you take the time to put in that image vs. one of your chisels? Check out their website I posted above. 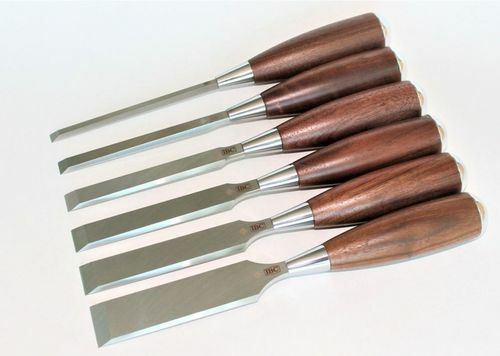 Maybe to sell the chisels-sneaky re-direct since is new post from new member-not even close up pic of the butterflies to show the work quality of the chisels? Thanks for the review. Somewhere down the hiway I want to replace my old Marples and have been eyeing lie Nielsen, Veritas, and IBC. I have wondered about the weight of the IBC? I can’t imagine that they are more than my Marples, but wonder how they compare to L-N. How do they feel when you are paring? The lie nelson & Veritas are very good chisels. Right out of the box I feel that the IBC chisels are flatter than the other two. Besides the way they feel in my hands and I have big hands, the fact that you can remove the handles to sharpen them sold me. The flatness and the way they hold their edge really make paring a breeze in both hard and soft wood. I originally purchased the 3/8” to try before buying the rest. I now have a full set and do not plan on changing. I don’t really understand why removable handles would be beneficial for sharpening. Furthermore, the handle can be removed from the L-N chisels (or any other socket chisel) so that’s not really a ‘feature’ that’s unique to the IBC chisels. If you do some research and watch Rob Cosmans video on the IBC bench chisels you will understand why I made that statement. Even thought you can remove the handles on all socket chisels you cannot remove the ferrule. You don’t know me or the way I sharpen. Rob Cosman sells for IBC. Nothing wrong with that inherently, but he doesn’t know that neither handles nor ferrules are a detriment to my sharpening. Felk didn’t understand, you weren’t willing to explain. Glad you’re happy with the IBC chisels bats, but your review hasn’t proven to be very helpful. Chisels like most hand tools are an individual thing and if you would have read my first post I stated that they are perfect for ME. I do not know Rob Cosman but I do do extensive research before I purchase than make my own decisions on my tools. I tried the IBC, Veritas and Stanley and the IBC felt and performed best FOR ME !!!!!. As I said, if you had read it, I’m happy for you.